My loves, to the left take in the glamour that is Givenchy’s Platform Pump – the very same ones seen on Ms. Katie Cassidy on Gossip Girl; to the right brace yourself for the beauty of Nine West’s stunning Showstoper in Black Leather. 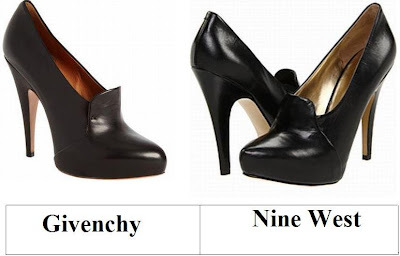 While the Nine West wonders lack the Givenchy label; for a mere $119.00, as opposed to the $700.00+ price tag of their couture cousins, they are le perfect compromise for the cheap chica – and allow one to scoop up not one, not two, not three, but all four saucy shades (Black Leather, Dark Brown Box Leather, Black Suede, and Dark Red Suede)! Thanks to Barney’s and Zappos for the pictures. I'm so glad to see a cheaper version just as beautiful. Black pumps, definitely a wardrobe necessity. Le perfect compromise for me, though. Totally, awesome find. A really must have. is it crazy that i love the nine west ones more??? Ah those Givenchy ones are pretty spectacular! the nine west version is really cute! There's a hilarious scene from Will and Grace where Karen goes to Will's basement office and goes "what a horrible view! You just sit all day and watch bad shoes go by. See, look! I just saw a pair of Nine West." After that scene I immediately got self conscious about my many pairs of Nine West shoes. But I love them! Those are really cute shoes! Man, my wardrobe needs an update!!! These seem very librarian chic to me, which I adore. :) I think the less expensive pair is just as fab! Perfect match -- I love the Nine West ones! You know I always lean toward the expensive side of things, but the Nine West shoes are really close to the Givenchy's. ii think shoes are not really worth. really beautiful shoes! Great find!! They're so beautiful. I love the Nine West pair. great find! nine west it is!! There is something about the big ticket that I prefer on this one... can't quite put my finger on it. Perhaps it is the level of shine? These are cute! I'd love the Givenchy's, but the Nine West one's are a good price for the look. Such a classic! A great find! I love both, but my wallet screams Nine West. The classic lines around the shoes are perfect. I love nine west's sandals, they're aaaamaze! What a great find I cannot believe the price difference, I can take the Nine West on this ones, they are identical and love how Nine West fits. Of course save! They look identical! I love the way the heel tapers down in both versions. A true classic pump! Nappa leather tapered toe platform pump with extended throat. 100mm covered heel Leather sole Available in Grey Made in Italy. you can barely tell a difference! loving the nine west price.